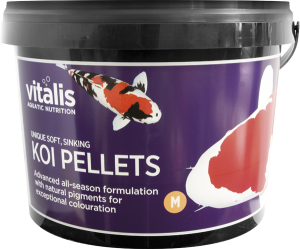 Vitalis foods have just announced that they have been working on and have produced a range of soft pellet foods specifically designed for koi and other pond fish. Vitalis koi pellets are like their marine and tropical pellet; a soft, highly digestible, sinking pellet. This food uses natural and raw ingredients that can also benefit your water quality too. This Vitalis food can be fed all year round to your fish removing the need for different feeds depending on the season. The Vitalis koi pond pellets improve growth, boost the colours on your fish, make for better water quality and helps your fish develop good body shape. These Vitalis pond pellets come in three sizes: Small (1.5 mm) Small+ (4 mm) and Medium (6 mm). We are very excited about this range of foods as Vitalis are one of our favourite food brands on the market today and we will definitely be testing them out in the shop!